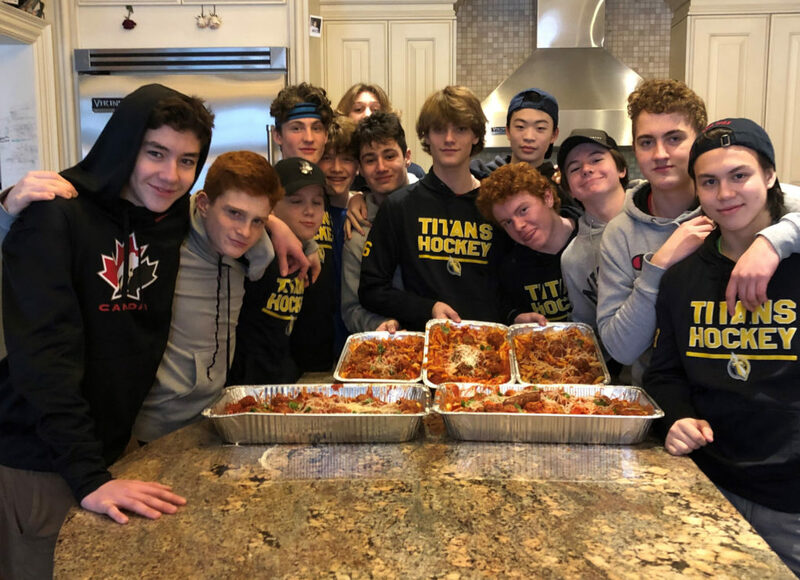 A third place regular season finish and a 20-7-6 record weren’t even the most impressive accomplishments made the Bantam Toronto Titans this season. While the team’s on-ice chemistry led them all the way to the Scotiabank GTHL Playoff semi-finals, it’s their actions off the ice that truly yield the best results. Nicholas has become a product of the Titans mandate, which states the Club aims to develop not only great hockey players but outstanding citizens as well. Cella, who created the give back program six seasons ago, has seen teams partake in a variety of activities, including assisting in women’s shelters, seniors residences, and local food banks. Cuan, along with his teammates, participated in the program this year by preparing home-cooked meals for the Na-Me-Res men’s shelter. The team gathered at a teammates house to cook and then traveled to the shelter to deliver and serve the food. The team has also assisted the Gladiator Hockey program for developmentally challenge athletes – an activity they find extremely gratifying. The Bantam Titans will host the Bantam “AAA” OHF Championships next week at Herb Carnegie Arena. Click here to learn more about the Titans give back initiatives.